SAINT PETER—In an attempt to add a new element to the biannual “Midnight Express” finals relief event, the Campus Activities Board rented out a full-sized steam locomotive to appear when the doors opened. The train, dubbed “The Midnight Express Express,” quickly made an undeniable impact on those waiting to access the event’s free food and drinks. 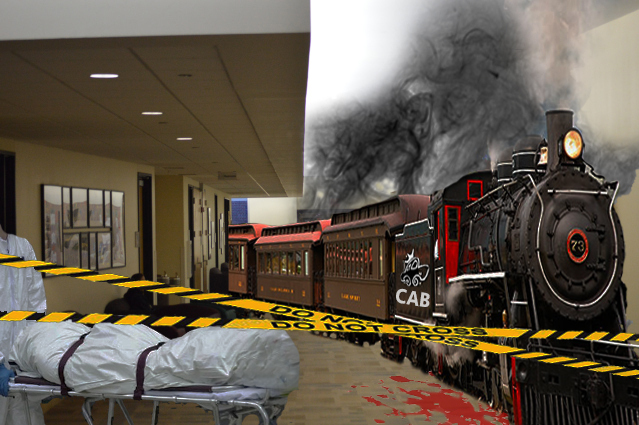 Some logistical details were overlooked, however, resulting in a 330,000-pound, 12-car steam engine train barreling into the campus center at 120 miles per hour. This blunder has compounded with the hundreds of personal train wrecks currently being suffered by the student body in the buildup to final examinations. Despite some fallout from the train’s arrival, CAB has deemed the addition successful, and hopes to make it a traditional part of the popular event. A photograph taken shortly after the arrival of the Midnight Express Express.